Purslane or verdolagas, one of those ingredients that Mexicans hanker for when outside of Mexico, is likely to be growing in your backyard. In Mexico, it is considered one of the quelites or edible herbs. 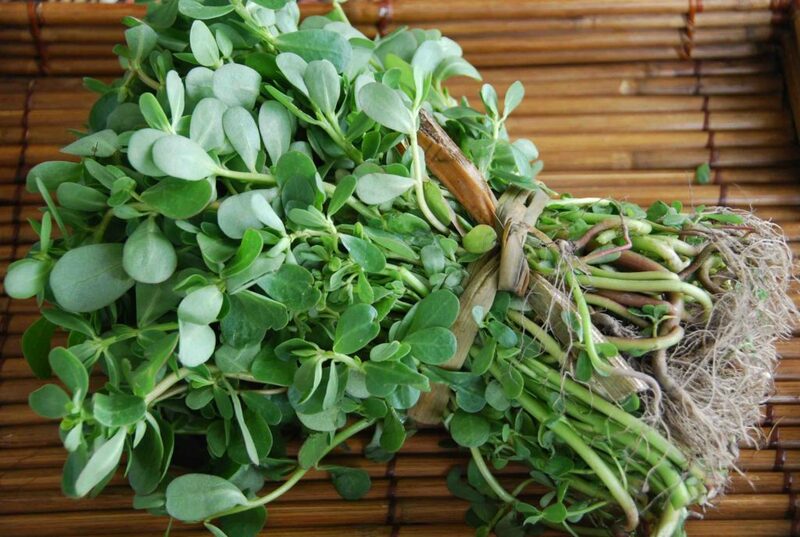 It is nutritious and succulent, yet it has long been considered a weed in the United States. Indeed, once it grows roots, it spreads and grows fast. It is essential to the cuisine of Central Mexico, where it is most commonly added to Puerco con Verdolagas: my favorite way of eating them. There, slowly braised pork is finished off in a seasoned salsa verde and verdolagas are dropped in almost when it’s done. From purslane, almost all is eaten. Only the very lower part of the stems and the roots are removed. The further you go down the chubby stems, the lighter the green color becomes and it can sometimes fluctuate to violet or red. The leaves are thick and crisp and the stems are crunchy. Both leaves and stems are very juicy and meaty. With a light bitter flavor, a bit lemony and a bit peppery, altogether, punchy and refreshing. Just like tomatillos, purslane’s tartness pairs well with other ingredients typical in Mexican cooking such as tomatoes and chiles. It is a great complement to salsas and taco fillings. Not native to Mexico, but as you can see, it is an ingredient that over ceturies has grown deep roots. Though my favorite way to eat them is cooked in that famous pork stew and in vegetable soups, verdolagas are also wonderful in hearty salads. Think watercress, but thicker, crisper, yet more defined and “vegetable” like. They can be prepared just like you would spinach or watercress too. So the options go from soups, casseroles and stews, to salads which can be simply coated with a generous squeeze of fresh lime juice, olive oil and sea salt. You can tuck them into a sandwich and feel like the most interesting sandwich-eating person on your block. 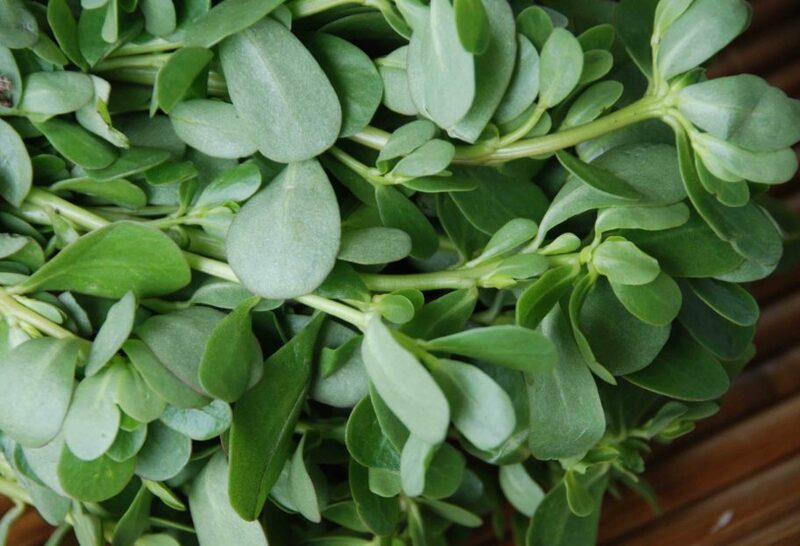 Because studies have shown it to be the richest in omega-3 fatty acids of any leafy green, purslane is increasingly being cultivated in the United States and is often available at farmers’ markets. You may find it under one of its popular nicknames pursley, pigweed or little hogweed. Or look closely, they may be closer to home. If you find them in your yard: cook them up! Hi Pati, I’ve been watching your show for years. In fact my Hubby and I watch one of your shows every morning. He tapes them and then we have a choice in what to watch. Recently I saw you make a Salad with Tomati Tomatillo, Avacado and Cucumber I think. You said the salad was one of your creations, it wasn’t a regular Mexican dish. Well sadly my hubby deleted that show so I dont have that recipe. Could you possibly send me that recipe? I thought at the time how good it would be. But as I said when I went back to review it it was gone. Please Pati I sure would like it Thanks in Advance. Oh that sounds like my Pico de Guac: https://patijinich.com/recipe/tart-pico-de-guac/ Enjoy…and say hi to your hubby for me, Lynda. These grow in my pack yard. But I didn’t know you could eat them. Good to know thank you. I’m glad you found the article helpful, Jeanette! Hi Patti, love your show! Please add me to your email subscription ASAP. I would like to forward this to other people. I was watering my few trees when I noticed what I remember to be verdolagas! I picked several bunches. Then I had a frightening thought. What if they are an imposter and poisonous . However, after looking at several photos online and when I began cooking them, I remembered the delicious aroma I remember from childhood. I will try them with tomatillos, hadn’t ate them that way, with tacos sounds great. Thank you for your website! Thank you! I also love verdolagas with scrambled eggs. I just read where you said the pick the purslane before they flower. Is it a problem to eat them after they have little flowers on them??? i JUST realized what they were and am very excited to start eating them. Hi Pati! I just picked a bunch of verdolagas from along the sidewalk on our morning walk yesterday, and then found more growing in my backyard! I learned about them last year when El Super, the huge Mexican supermarket in South Tucson, had them on sale, and a local newspaper reporter wrote about how his abuelita cooked them in scrambled eggs for a breakfast burrito – it was delicious, and I’m planning on trying some more recipes with verdolagas. I’m thinking they might be a good ground cover for a couple of bare spots in the yard. Thanks for the additional information! They are amazing with eggs, you just made me hungry and it is almost midnight here…. Hi there. I’m growing these in my garden bed right now. I picked up a bunch at my local Latin market. I cut the very bottoms of the stems off and poked them right in the soil…no rooting in water or any other special treatment. And this was AFTER I forgot them in the fridge for a week! They are growing like crazy! We love tossing them in salads, but would love a recipe for Puerco con Verdolagas, if anyone has one they’d like to share. They do very well in containers also. A nearby nursery sells them in hanging baskets. I grew up eating these beautiful and delicious little “greens”. Like most Mexican women, Mamá was a great cook. For years I searched but couldn’t find verdolagas in the regular supermarket but rediscovered them at my local international “super” market. I prepare them like mamá did with carne de puerco and a side of frijoles de la olla…comfort food. Love them with puerco and beans, too! Billy, Yes, soak them in hot water. Also remove the stems and seeds to make them milder. Thank you so much for watching the show! My mother used to send use out right after the rainy season to pick verdolagas. They were delicious! Hola Profesora Pati. Me ha dado un gran gusto de ver su show de cocinar. Yo recuerdo cuando viviamias sur oeste de los suburbios de Chicago, que mi mamÃ¡ me llevaba al jardin para cosechar “hierbas”. Bueno, total se llaman verdolagas. Cuando voy al supermercado, yo preguntaba a las señoras como se cocinaban. No sabÃ­an. Me daria gusto si usted me podrÃ­a enseñar como hacer las verdolagas con carne de puerco, o de res en salsa verde, por favor. Me encanta como Ud. Cocina. Sinceramente, Rainier. Verdolagas grow in my yard in spring and fall,and I love them with egg and salsa. Just remember to pick them before they flower, which happens quick in So.Cal. Hola Ray, That’s fantastic! I love verdolagas with eggs too.